If money is a bit tight at the moment, don't worry as you have lots of options. In this post we'll discover the best software, hardware, and setups that you can buy at budget prices. I've even found a few freebies for you! If you can't afford to buy top of the range DJ kit just yet, don't worry as you'll still be able to get off to a great start as a DJ on a budget. Learning and progressing as a DJ is possible using pretty much any equipment. It really doesn't matter how tight your budget is. DJing is possible for anybody and money shouldn't hold you back in your dreams. I personally learned to DJ on a budget, and I progressed faster than a lot of my friends that had industry standard kit. That's why I've put this article together, to let you know that you can definitely get to where you want to be even on a tight budget. The first thing to think about is what type of DJing you want to do. Do you want to keep it purely digital and mix via a computer or device? Would you like a set of decks and a mixer to play with? Or would you like something that combines both using DJing software and a controller? Whichever you chose, you've got loads of options and you can even get some software for free! There's tons of digital DJ software available making it difficult to know which is the best for your budget. You can find free apps available for iOS or Android so you can digitally mix using a tablet or phone. And some that you can use on your desktop. My favourite free software is Mixxx. Mixxx doesn't only allow you to mix, but you can really get creative with your DJing using the many awesome features. Mixxx gives you the ability to do the usual beatmatching and mixing, or you have a sync and auto mix function to do it for you. You can import your music library and iTunes library. It also features headphone cuing, and you can use it with a long list of controllers for a hands on approach. There's built in FX, you can add loops, you have full EQ and crossfader control, pitch control, the list goes on. The program is just great and being free it is definitely worth a try if you're a DJ on a budget. If you're more hands on and fancy having a more traditional set-up you have some great options. The best value for money has to be a DJ controller. A DJ controller allows you to mix directly from a PC or laptop with a hands on approach. If you already have a laptop it should do just fine as long as you have enough disc space for the software. DJ controllers are a great way of getting yourself a hands on set-up at a low price. They offer great value for money and can do everything that separate CD players/turntables and a mixer can. Take a look at a list of all of the top DJ controllers > HERE. In the article I found the best controller for the DJ on a budget to be the Numark mixtrack pro 3. The controller has a range of great features and could be a great option for the beginner or mobile DJ on a budget. I have a full review of the Mixtrack Pro 3 > HERE. Another really great low priced controller also featured in my article is the The Pioneer DDJ-RB. The price is quite unbelievable for something of this quality and can also be recommended to mobile DJ's. The good thing about this controller that saves you even more money is that it comes with an activation key for Pioneers amazing Rekordbox software. This means no further purchase is required for general mixing and DJing. I've personally used this controller and would compare it to the more expensive pioneer range. You will be able to add samples, loops and effects to your sets. You'll be able to scratch using the large aluminium jog wheels and get really creative using the bundled Rekordbox software. This controller will last you many years and really grow with you as you progress, perfect for the DJ on a budget. Again, check out my controller guide > HERE as you may find something else that will work for you and your specific budget. 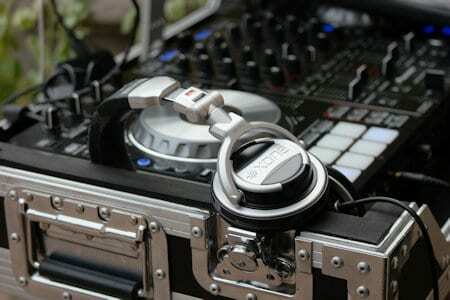 Your next option will be a set of CD players, turntables (decks), and a mixer. Again Numark are well known and provide great low priced DJ kit. The Numark NDX500 will let you play CD's or you can play music directly from a USB drive without the need for a computer. 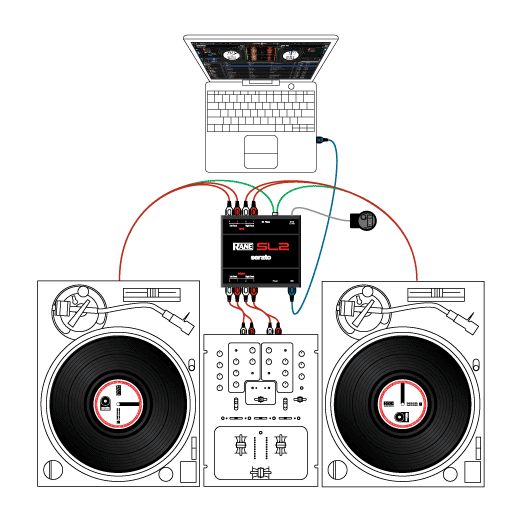 It can also be used in conjunction with a computer using compatible Serato DJ software! We'll talk more on Serato DJ later. Using the NDX500 you will have the ability to scratch, search and adjust the beat using touch sensitive jog wheels. You can adjust the pitch / speed of the track, set cue points, add loops, and there is a very well laid out digital display with track timers and track information. The Numark NDX500 comes in at a great price for the DJ on a budget and boasts functions you'd expect to see on much higher priced units. I'm recommending Numark again as I actually started off with a budget Numark mixer and it lasted me many years. It was even used for 7 hour sets at all night raves and it just kept going, I sold it fully functioning and expect it's still alive now. So for a budget mixer that you can expect to last, try the Numark M2 that unbelievably comes in less than $100. You'll have all you need to pull off the perfect mix. Although it looks minimal it features a 3 band EQ with gains. VU meters for master output and separate channel VU meters. A microphone input with EQs for the mobile DJs amongst you to talk to your crowd. You'll have a crossfader curve adjust so you can get more technical and learn to scratch. A mini headphone crossfader which I've always found very useful. The ability to use it with CD decks or turntables, and if it's anything like my first Numark mixer, a lovely smooth crossfader and up faders. This is another perfect option for the DJ on a budget. Another option is turntables. You may want a set of two, or just one to mix in the odd vinyl or to scratch with. There aren't many good budget options as lots of them are belt driven. Sure, you can mix with belt drive turntables, but they are harder to use. I've found you have to push the record as you let it go, and they're not brilliant for scratching because of the low torque. For that reason I won't recommend belt driven turntables in this article. If you can find a used pair of Technics 1210 then you'll have one of the best turntables ever made. Unfortunately Technics have discontinued production of this once industry standard turntable. You can find them second hand, and the going price may fit your budget. I bought a pair brand new and they lasted me for thousands of hours without a problem until I sold them. What a mistake I made by selling them! If you're looking for a good brand new set of budget direct drive turntables the best option is the Stanton T.62 M2 that come in at a brilliant price for what is on offer. You'll have a nice amount of torque for mixing and scratching, and a good well lit layout. You can play 33rpm or 45 rpm, and they should last you many years. It has great reviews and will make for a good budget set-up along with a mixer, plenty of vinyl, or a DVS. Another option is the Pioneer PLX 500, it is slightly more expensive but works great for beginners. It also comes from a trusted and well respected name in the DJ industry. Higher quality headphones will give you a wider frequency range, bigger drivers and a stronger design. But it's still possible to mix perfectly using cheaper headphones. The Behringer HPX2000 come in at an amazing price that fits any budget. Boasting large 40 mm drivers and 20 - 20,000 Hz frequency range. This will be plenty of power to DJ at loud parties of even mobile DJ gigs. The HPX2000 have a rugged full swivel design which is important for DJing. And they even come with a handy 1/4" plug adaptor, something all club DJ's should have for varying mixers. They sell at a great price for the DJ on a budget, and once again they have great customer reviews. I'm only recommending budget headphones to people that simply can't afford more expensive better quality headphones. Buying cheap headphones will cost you much more in the long run as they simply don't last. Check out my full buyers guide that also features the TOP CHOICES available HERE. And you'll also need to learn how to your headphones correctly, so go here -> show me how to use them. As you're a DJ on a budget I'm recommending a DVS mainly for people that buy vinyl turntables to save on the price of vinyl. But a DVS can also work perfectly with CD decks and is still worth getting if you have the spare cash. If you're unfamiliar with a DVS they basically allow you to plug in your turntables or CD decks to mix music directly from a computer. You'll need software like Serato DJ or Traktor Pro. And you'll also need a sound card (audio interface) like the Rane sl2 pictured below in the usual set-up. You can get cheaper options like MixVibes DVS. Cheaper sound cards are hard to find but the ESI MAYA44 USB+ will do the job perfectly and will suite the DJ on a budget. You will be able to get two control vinyl and two CDs that are encoded so that you can control any track in your computers music library. These control vinyl/CDs can then be used just like the real thing. They will be used to play music files from your computer whilst using the turntables or CD players in a traditional way. You'll never need to buy vinyl records or carry heavy boxes or bags around. And when you're DJing you just leave the same two control vinyl on the decks at all times. This makes vinyl DJing affordable to anybody and is a great way of incorporating turntables into your set-up on a budget. Read my article comparing serato and traktor's software HERE. These are the best two options available for a digital vinyl system. The last thing you'll need to get yourself mix ready is a set of speakers. As you're on a budget you may be able to use any old speakers you have in the house. You may need an amplifier to connect them to your mixer, unless they are active. Active speakers have an amplifier built in and can connect directly to the mixer. They can be pricey but are still cheaper than buying a separate amplifier with passive speakers. Pioneer do the DJ DM-40 pictured below at a fantastic price. The recommended Numark M2 mixer will plug straight in to the left speaker using phono plugs, then you just connect the two speakers using the supplied speaker wire. The left speaker will plug straight into your mains power using the supplied cable. These will make great monitors for home DJing, giving punchy bass and great clear highs. If you're looking for mobile DJ speakers take a look at my mobile DJ guide HERE. Once you have the kit you'll need some music. Buying music can get pricey so try looking around for free downloads, this can really help you out if you're budgeting. I'd advise against YouTube downloads, the sound quality will be poor, plus you won't be supporting the artists by downloading their music for free. Search sites like Soundcloud for free downloads. There are thousands of artists willing to give away free music and you can find some really great tracks there. If you want to be a DJ you'll probably already have a love for music and a computer full of it, so use what you have for now. Get to grips with the mixing by reading my how to mix article here. Then if you have any spare money you can find some cheap download sites to start building your library. See you behind the decks! The kit listed above will be all you need to start DJing. You can start learning and progressing using this kit and it should last you for many years. Some of the best DJ's I've ever known are DJ's that started off on a budget. Even those that started DJing before the age of the computer and were all mixing vinyl on belt driven turntables. I've known DJ's start mixing with cassette tapes and progress to be well respected club DJ's. Just because you are using cheaper equipment, doesn't mean your skill level will be any worse. Stay true to the game, learn every DJing trick you can by looking around this site, and you'll soon be up there with the top DJ's making crowds go wild! You can check out more DJ mixers in my list of the top 5 > HERE. And check out my review of the great value Pioneer DDJ-1000 controller > HERE.